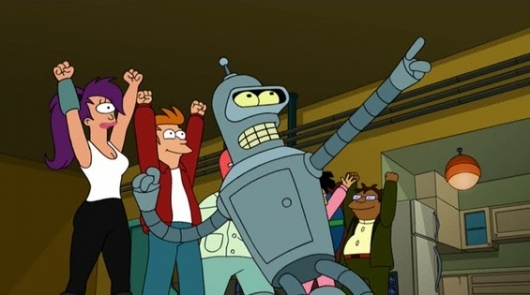 While it’s not the full resurrection fans are hoping will one day happen again, and it’s not that 3D remake we saw recently, it has been announced that Futurama will indeed live again…for at least one day. In something you’d think would have happened a long, long time ago, the characters of Futurama will appear in a crossover episode of The Simpsons this November 9th. Both series were created by Matt Groening, so it makes all the sense in the world to have the two animated worlds meet up; it just took a while. The new animated series of The Avengers is a fantastic journey into fun adventure, with writing that embraces the best elements of all Marvel media, wrapped around the original comic book foundation created by Stan Lee and Jack Kirby. 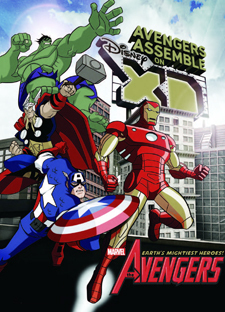 Taking these elements involved, and coupled with excellent voice talent, and an animated style that pays tribute to earlier cartoons, The Avengers is a lot of fun for comic and superhero fans of all ages. 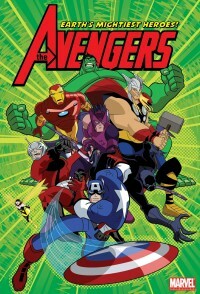 Avengers: Earth’s Mightiest Heroes is Marvel’s second crack at the premier superhero team in the animation world. The first series, Avengers: United They Stand, was an honest attempt to make the concept work but that failed quickly, mostly due to the lack of presence from the more popular Avengers. Now, with the Avengers movie just around the corner, Marvel is dead set to make a cartoon worthy of the proposed blockbuster film. The premise of the series harks back to the original concept of the comic book series. When a threat of epic proportions rears its ugly head, only the Avengers can save the day. In the original comic book, the threat was Thor’s evil brother Loki but in the cartoon, it is the breakout of various super-villains. It seems an unknown individual has disassembled world police SHIELD’s securities systems and caused their systems to crash. As a result, four super prisons went offline allowing all sorts of villains to escape. Now, it is up Earth’s Mightiest Heroes to capture them all back. REMINDER! New Episodes Of ‘Futurama’ Start On Comedy Central TONIGHT! It’s here! The brand new episodes of Futurama we’ve been begging and pleading to get for years now are finally set to begin at 10pm tonight on Comedy Central! In all honesty, it strangely still feels like we have a lot longer to wait, but the excitement has been building this week knowing the time has arrived. This post is in an attempt to do two things. One: to remind you that the show is back, and begins tonight…just in case you had forgotten. Two: to make sure that every single one of you who has even the slightest bit of love for Futurama puts every TV you can on at 10pm! Tonight brings not one, but two new episodes, and the more viewers that they get for each episode, the better chance we have at getting more than just this one new season. The goal wasn’t just to get this show back, but to get it back for a long, long time, much like we saw with Family Guy. If you have DVR, set every new episode to record, even if you’re watching as it airs. Do what needs to be done! 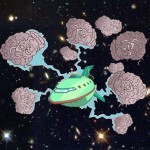 Geek Peek: First Image From New ‘Futurama’ Released! Back in the beginning of March, it was announced that the desperately-wanted return of Futurama would finally make its second series debut on June 24, 2010 at 10pm EST. Now the very first image from the show’s big comeback has been released, and it’s a bit strange. The Matt Groening and David X. Cohen series, which ran for four seasons from 1999 to 2003, was canceled by Fox after they severely-mishandled the show and moved it all over the TV schedule thanks to sporting events and not-so-bright executives. This didn’t sit well with fans, and as you know they’ve been fighting to get it back ever since. A fifth season in the form of four direct-to-DVD movies proved the fan-base was stronger than ever, and the sixth season was finally greenlighted almost one year before it’s scheduled return to your TV. 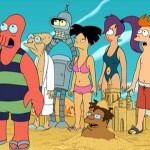 Click on over to check out the gruesome (yet still hilarious) first image from Futurama‘s return! 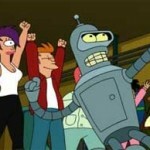 New ‘Futurama’ Set To Officially Debut On Comedy Central In June! Comedy Central has confirmed what we’ve all been waiting to hear: Futurama will officially be back on your TV sets on June 24 of this year! To catch everyone lost in the dark up: back in 2003, 20th Century Fox was silly and canceled a little show called Futurama way before it should have been canceled…as they have been known to do on occasion. Since the show was killed off, its fans have continued to scrape and claw any way that they could in order to try and convince someone to bring the show back. At first these efforts seemed futile, but after another Fox show, Family Guy, proved that it can be done, these pleas have consistently grown stronger and stronger. Fans of Futurama were convincing enough to persuade the studio into giving the animated sci-fi series one more shot in the form of four straight-to-DVD movies. Bender’s Big Score, The Beast with a Billion Backs, Bender’s Game, and Into the Wild Green Yonder eventually were born and released into the world; and to our pure elation, they did just well enough to force those Suits into a few meetings that lead to the decision to give the show one 26-episode season. All has been quiet since the exciting and infuriating drama that unfolded from the time that it was announced that Futurama was coming back to TV, to when we were told that Fox was ready to re-cast all of the voice actors, and then the relief of being informed that all was remedied and the regular cast would return. With hopes of seeing the first of the new 26-episode season order by this Summer, it’s getting around the time when we begin itching for some kind of teaser trailer or anything like that, but nothing has been released yet. To hold us over, Newsarama was able to have a little chat with Futurama‘s own Phil LaMarr, who spoke about how things are going and when we might see the new episodes. LaMarr voices accounting guru Hermes Conrad on the show, among others, and has a multitude of other voice acting jobs under his belt. He’s also known from his work on Mad TV and as Marvin in Pulp Fiction! UPDATE #2: I was able to hear back from Fox again, and was told that Billy West and John DiMaggio did indeed sign on along with everyone else. Futurama is back, folks! UPDATE: The trades are reporting that all of the cast members, including West and DiMaggio, have signed new deals. As I said earlier, someone from Fox told me directly that only the three actors were confirmed so far, and I haven’t heard anything since then, but the big boys seem to have heard differently, so it all seems legit. Rejoice! Earlier today, the news that we had all been waiting for was announced: the original voice cast had been signed for the upcoming new 26-episode run of Futurama. The news was initially reported by The Star, but has since changed up a bit: I contacted someone at Fox who confirms that Katey Sagal (Leela Turanga), Maurice LaMarche (Kif Kroker/Hedonismbot/Morbo/Donbot/Clamps), and Tress MacNeille (Mom) had all officially signed on. This of course means that the biggest name of them all, Billy West (Philip J. Fry/Dr. John Zoidberg/Prof. Hubert Farnsworth/Zapp Brannigan), and John DiMaggio (Bender Bending Rodriguez) — who admitted that he was confident all cast would return at Comic Con — had not yet signed on, but it is hoped that an agreement will be reached with the rest of the cast soon. The news comes after the shocking report recently that the original voice actors with stuck in a financial dispute, and that a casting call had gone out to find new voice actors to take on all of the show’s roles. I’m not feeling great this week, so when the floodgates opened up today with a frenzy of backlash in regard to the news that 20th Century Fox is looking to re-cast all of the voice actors for the revival of Futurama…well, my little illness tripled over on me. That’s right, after making the giant announcement that the show would return (Read: Never Underestimate The Power Of Hypnotoad: ‘Futurama’ Is Officially Back! ), they now are looking to replace brilliant talents like Billy West (Philip J. Fry, Professor Hubert Farnsworth, Dr. Zoidberg, Leo Wong, Zapp Brannigan), John Di Maggio (Bender), Katey Sagal (Turanga Leela), Phil LaMarr (Hermes Conrad), Maurice LaMarche (Kif, Donbot, Morbo, Calculon), and others. At first, many believed it was just some sort of marketing ploy and that the plan was to throw everyone into a panic and then throw some big surprise party with the cast showing up and all being well in the world. Though this scenario would be accepted and laughed about later, I believe it would still infuriate fans to hear they purposely did this. However, it appears that word first broke out when multiple cast members mentioned it on their Facebook, which takes away a Comic Con surprise. Then there is Forces of Geek, who brought the news to us with a giant official-looking casting call with all the characters that they want to re-cast as well as clips on Hulu to use as reference. As it stands now, the situation looks like a good ol’ executive blackmailing attempt. Fox doesn’t like the salaries that the actors want to be paid for their work, so they tell everyone to screw and put out a casting call for other voice actors in hopes that the original cast will lower their fee. A truly dirty and despicable play by the studio. As any fan of the show will tell you, no other show’s voice talent is as important as the cast of Futurama. That core of talents is so good, it just doesn’t matter who they found or how accurate they sounded, you know it just wouldn’t be the same and we would all be able to tell the difference. These guys deserve every single dollar that they’re looking for, and it’s very unlikely that they’re demanding more than is fair. Click over to the other side to get a look at the call for submissions the studio has put out. Futurama aired from 1999 to 2003, but it was canceled after its fifth season. Though it got off a few more seasons than Family Guy and Firefly, it’s definitely classified among the shows that Fox has canceled way too soon. As we know, Family Guy was brought back and soared to immense success, while sadly, Firefly remains buried and cold. Futurama kind of fell in the middle of these two. It wasn’t brought back to TV, but noticing the fan demand, it was decided that four direct-to-DVD movies would be made to see where the shows popularity stood. The first three to arrive were Futurama: Bender’s Big Score, Futurama: The Beast with a Billion Backs, and Futurama: Bender’s Game. Bender’s Big Score was loved by fans and did well, while the other two did decent, but weren’t quite as praised as the initial offering. Either way, fans were thrilled just to be getting some fresh content. 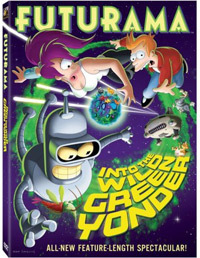 The last movie to come along is our review today: Futurama: Into the Wild Green Yonder. It’s a little bittersweet this time, because after this movie, the future of Futurama is uncertain. There’s always the chance that this may just be the last we ever see of the gang.